We have had a Facebook page open to the public for Max for several years, but the audience has changed and so has Max, so we closed that down this week and let Max have his own Facebook profile for just his friends and family to be able to interact with him. We've noticed a few things about him having an outlet to visit with people and wanted to share. For starters, it's been incredible to watch him want to engage with people by asking questions. It's also been incredible to see how more of his family and friends are engaging with him, not just to us to get the message to him. The shift has happened where everyone is answering his questions, where before it would be a lot less impersonal. Max has wanted to use his talker daily since giving him this outlet to visit with people. For a kid who is stuck in his house most of the time, online communication has always been his most usable way to be in touch with people. Here are a few of the posts from this week. 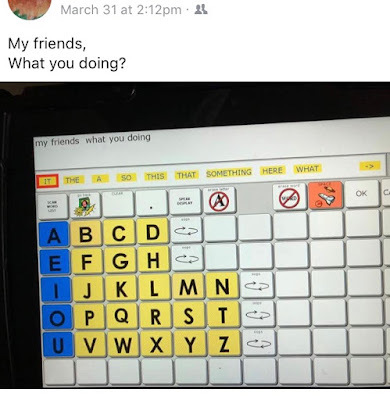 For his first post, he asked "My friends what you doing". He got lots of responses and in turn responded to the questions they asked him. It was a busy afternoon of visiting. 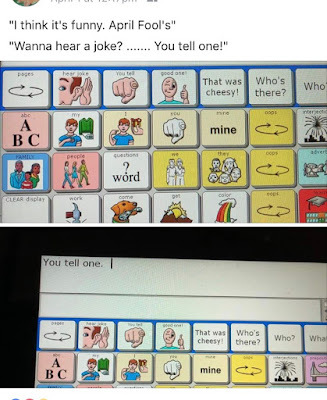 On Easter/April Fools he wanted to hear some jokes from his friends, and they did not disappoint. I think once he realized people were really into visiting with him, he wanted to tell them a bit more about himself, and ask the question, "you like my dog George?" He got answers with photos of everyone's dogs, cats, and turtles. 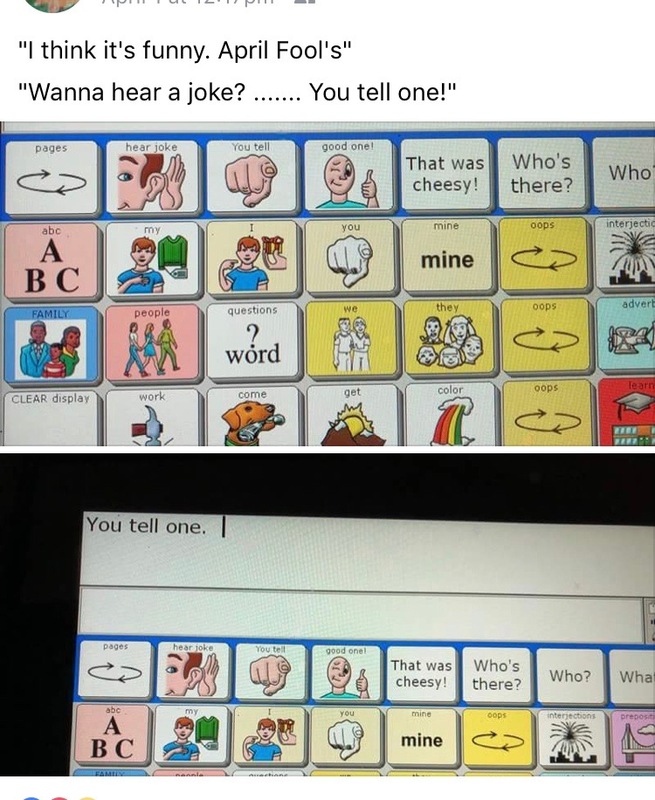 And he responded with comments about them all. Except the cat and turtle...we'll have to get back to those. 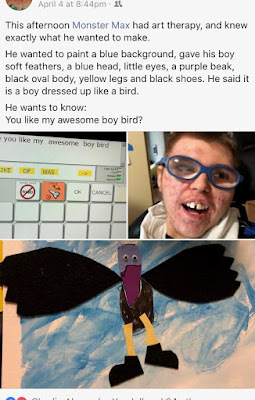 In art therapy this week, Max made an awesome boy bird. This boy bird was for Dad's office. And it may look like a bird at first glance, but it is a boy dressed up like a bird. 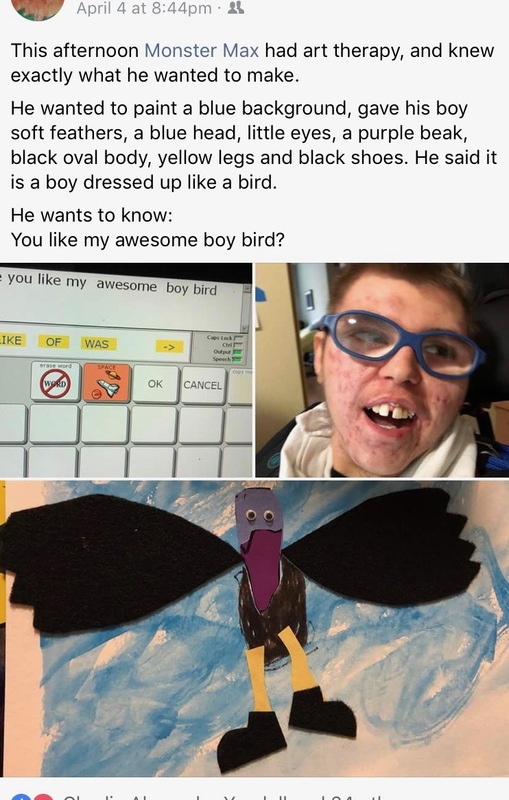 He wanted to know if everyone liked his awesome bird boy. 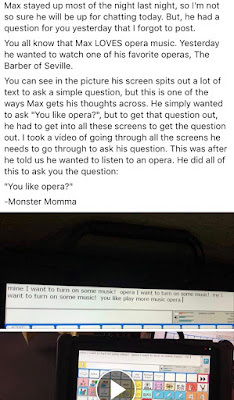 And finally, he wanted to know if everyone likes opera like he does. It was a bit trickier to ask this question, so I took video of how Max has to go through so many areas to ask a simple question sometimes. This is the video of how many times Max has to click his buttons to ask the question, "You like opera?" See, Facebook isn't all that bad. 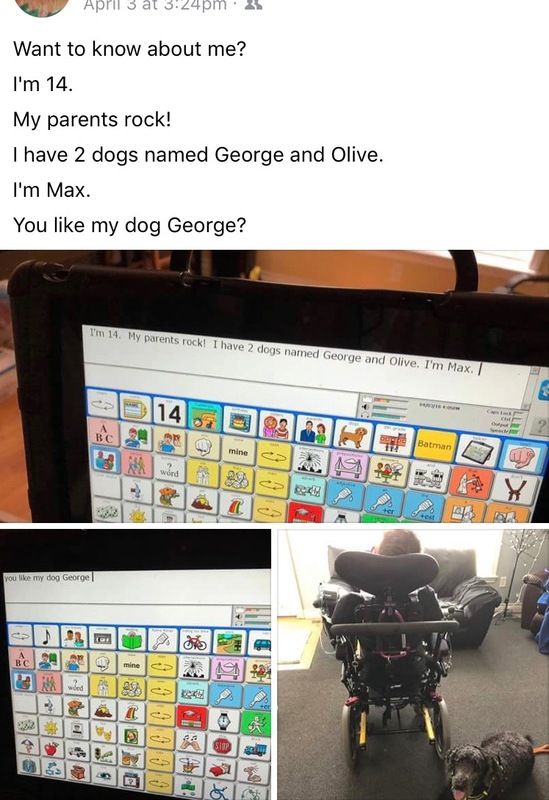 It's opening the world up for Max.